Half way up from London to Glasgow there is the fabulous Lake District. I had this image of melancholic rain around the lakes, rolling hills packed with rabbits (it did inspire Beatrix Potter back in the day!) and wet wet wet weather. Well, I wasn't far off but the scenery is ten times better than what you've heard of or imagined. No rabbits I'm afraid! And may I also add...you are in for a treat with the pictures we managed to take. The clouds and the hills were posing for us! Houses on the hills around Grasmere. Spot the stream surrounding the house and pouring right into the field at the front? It was raining the whole time we were there but somehow rain suits this place. Streams pop out of every little mountain slide. Low clouds hug the hills as they pass throughout the day. Such a romantic landscape! We stayed at the Daffodil Hotel & Spa, with its' quirky art and spectacular setting. 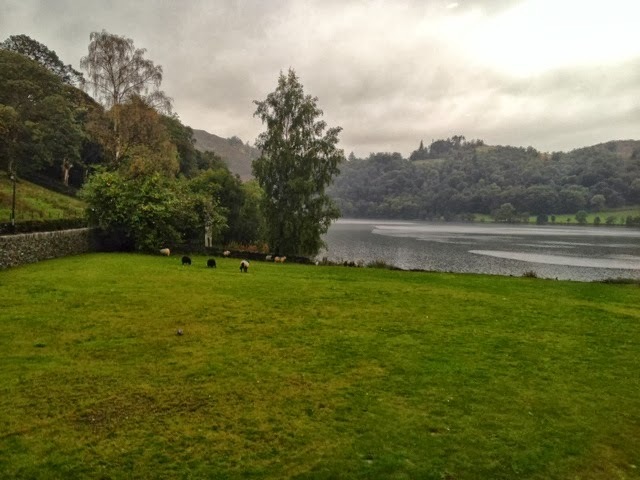 We could hardly concentrate on breakfast; with every bite we were taking a peak at the spectacular scenery: lake Grasmere, hills covered in low puffy clouds and pairs of sheep munching away on grass in the rain, so serene!